Every Passover I make this chocolate caramel matzo recipe from Marcy Goldman’s classic book A Treasury of Jewish Holiday Baking . When I was growing up I loved matzo with butter or my mother’s matzo brei, but as a dessert it never inspired me. Until my friend and co-author Jeff introduced me to Marcy Goldman’s recipe she calls: “My Trademark, most requested, absolutely magnificent caramel matzoh crunch!” Despite the main ingredient being matzo it satisfied my craving for a decadent dessert at Passover. The candy was met with rave reviews and is now part of our tradition along with the fruit pâtes. It really is magnificent and a bit addictive, which is why I save it for Passover! I’ve used milk chocolate and bittersweet chocolate chips from Guittard in the recipe, because they are kosher and I had them on hand. If you want to doll them up even more you can use a really high quality bittersweet or even white chocolate, some are not kosher. I prefer to use extra bittersweet because it is a nice balance to the caramel baked matzo, but my 6 11 year old son insisted I sprinkle some milk chocolate on too! You decide which way to go. Line a baking sheet with foil. Preheat oven to 350 degrees. In a sauce pot cook the butter and sugar over medium high heat for about 3 to 5 minutes, whisking constantly. The caramel may melt and be transparent or it may look more crystallized looking as in this batch. It doesn’t seem to matter once you bake it. Spread it evenly over the matzohs. Bake for about 15 minutes. Check half way through to make sure it is not browning too quickly. Rotate pan. Let the chocolate sit for 5 minutes and then spread evenly over the matzos. 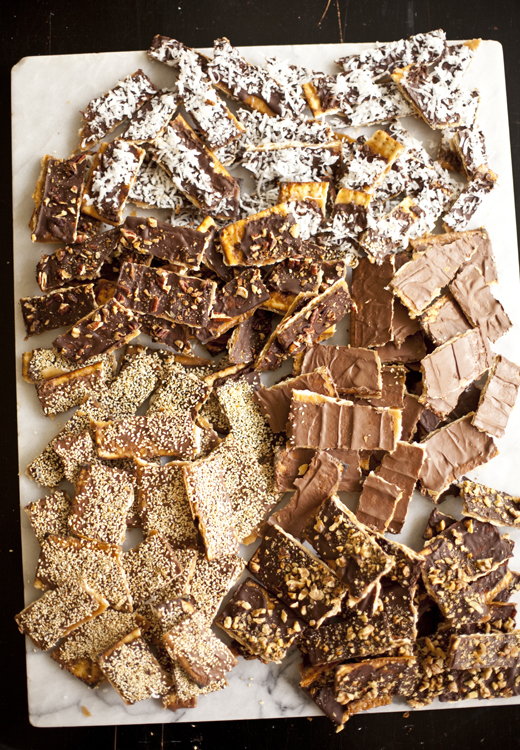 If you want to jazz up your caramel covered matzo, add toasted nuts or sesame seeds or coconut flakes to the melted chocolate. If the chocolate is not setting up at room temperature, place the matzo in the refrigerator for about 10 minutes. Break into strips or bite sized pieces. I am bookmarking this recipe since Passover is coming very soon… and I’d love to have a decadent treat for after dinner during that week. They look really wonderful! Thanks for bringing such a nice recipe for Happy Passover. Be warned ladies, You will want to double the batch. They really are addictive and will be gone before you know it! as if i needed another reason to love matzo. i am making this, and soon. and probably a triple batch. although plain matzo with salted butter will always be my first love. That is what I thought until I had these! I just wish I had known about this recipe when my grandfather was alive. He had the greatest sweet tooth and a love of matzo. My mother made this exact recipe but with saltines. Its soooo good, the sweet and salty combo. I recommend using the new ‘non stick’ foil since sometimes the regular stuff can stick. I’m so glad you put this recipe out there. But the one I’m actually thinking of making for Passover is the fruit pates from your last post. They reminded me of (a better version of) those awful half-circle “fruit” candies we used to get every year. But pates seemed so elegant! Is pectin kosher for passover? Most matzos for passover are unsalted, but I’m with you on the salty/sweet combo. You can use salted butter or add 1 teaspoon salt to the recipe! Thanks for the tip on the non stick foil, that would be a great help! I meant to suggest serving them both. Those gummy fruit candies we eat at Passover are generally really bad and taste as if they were packaged decades ago! The pates and the caramel matzos are a perfect combo. Yes, the Certo fruit pectin is kosher, but for passover I’m not sure? I do this exact recipe but I add slivered or sliced almonds to it for an added crunch. It’s like Pesach Roca. Yours looks great. I’ve rolled the end in pralines that I’ve ground up in a food processor. They are crunchy and look beautiful. Definitely will make this for Passover this year. Well, I sold another of your bread books at the doctors lounge this past week. I spread the word around Tucson a few weeks ago and I know two people who each bought one and you know how that makes sales just spread around when one member of a community buys one. My son is having a ball with his book. He just had a minor surgery (too many babies too quickly) and called me from his recovery room asking me to please go buy him some King Arthur flour at Byerly’s with carraway seeds. When he gets up the first thing he wants to do is bake a rye bread!!!! Zoe, you are an inspiration. Stu B.
I hope your son recovers well and fast so that he can get to the rye. 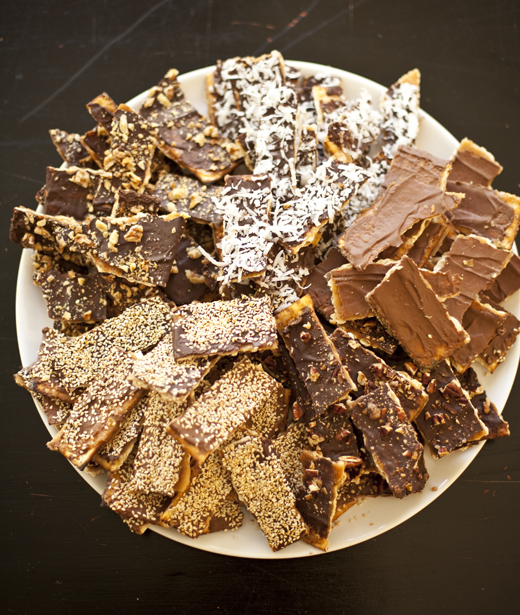 The fruit pâtes and chocolate caramel matzo are a must at passover. Enjoy! Followed the directions. Even took it out from the oven 3 minutes sooner. Why did the bottom burn–and how can I tell in the future if it is burning? Did this happen to anyone else. The pieces I tasted (without the charred bottom) were absolutely incredible. Make sure that you are using an oven thermometer. Your oven rack should be in the middle of the oven and be sure to check it often. If you are doing more than one tray, rotate them up and down and back to front. The original recipe called for a 375 degree oven and I felt that was way too high! I hope you enjoy these treats at passover as much as I do! I’m not sure if I’ll get anymore kosher desserts posted by Saturday? I’ll try! YUMMY!!!!! amazing! thanks a lot and jag pesaj sameaj from Madrid! I hope you enjoy the matzo. Oh, we had these for passover too–they are so addictive. Too true, I can eat a whole batch myself. If you have any other easy ones like it please pass them along.. Here is another really easy recipe for coconut haystack macaroons. I’m so glad this is posted. It’s actually the same recipe I’ve used for years (my neighbor has given it to our entire temple and grade school. Anyway, I also ad sprinkles to the top for color or some coconut the left-over from the macaroons I make. Thanks again. My 13 year old son is now making chocolate covered matzo after spotting your recipe over my shoulder while I was online! He comes home after school, melts some chocolate in a pan and smears it on the matzo. Immediate consumption after about 10 minutes in the refrigerator. Great use of leftover matzo! I am so sorry that I have this recipe!!! It is way too easy to make and I CANNOT STOP eating these!!! I thought it a good way to use up extra matza but now I am going to have to buy more! Seriously, I love this recipe – much better than the soda cracker or graham cracker version. MMMMMmmmmmmm Yummmmmy! Thank you Zoe! These are exactly like what I had at a friends house last weekend. Thank you so much for posting- I can’t wait to try it myself. I’m curious to try your method and see if there is a big difference? I am going to try this very soon and if we like it I am going to bring it to Passover. Thanks! I’ve made this recipe, courtesy of my sister-in-law., who got it from a co-worker, for the past couple of Passovers, and it’s been a big hit. Making it again this year. THANKS! This is the best I’ve seen. Found your blog thru David L’s blog. Lucky me!! Can this recipe be doubled? I’m specifically wondering about the making the caramel. This will be a fabulous intro for two small kiddies into the delights of sweet matzoh! Yes, you will absolutely want to double the recipe so you have lots of it! Just be sure to have enough baking trays to lay the matzo out flat. Passover Preparations « Baking and Caking! I make it with dark chocolate and marble white chocolate on top. YUM. I took pictures. So, you finally discovered “Matzo Crack”! LOL! I’ve been making a version of this for the last several Passovers, and it’s a huge hit. And addictive! Some companies, such as Manischewitz, make a bittersweet, non-dairy “baking” chocolate. If anyone’s observant, make this with non-dairy KP margarine, as well, and it can be served as dessert with any meat meal, too. Can I make this ahead and freeze it for a few weeks? I’ve never tried freezing it, but if you do try it, you’ll want to wrap it very well and then let it defrost while it is still well wrapped. is there much of a difference using brown sugar or white sugar? Brown sugar has some molasses in it, so the flavor is richer and the color is more caramelized. If you only have white sugar, you can add a teaspoon or so of molasses. This looks delicious. I’m doing a spring link up today over on my blog…http://rustsunshine.blogspot.com. Would love it if you would join us with any of your great Passover recipes! I have made this recipe before, but had an inspiration today. A pizza cutter works well to cut the boards into smaller pieces. So glad you and Zoë enjoyed them, I’ll have to try the marshmallows! Thanks for the idea! I make these every year. I like to call them Passover Crack. I also think they would be fun with white chocolate and cranberries. Congrats on the mention in the Strib too! I love the white chocolate and cranberry idea! I never got any sent my way! There will be matzo in your future! Oh these look and sound so good. I have never had or cooked with matzo. Is there any special brand that I should look for or they all about equal? Where I live the brand that is most readily available is Manischewitz. I may be one of the few people that actually loves matzo and craves it every year as Passover approaches. But wow this kicks it up about 5 notches! 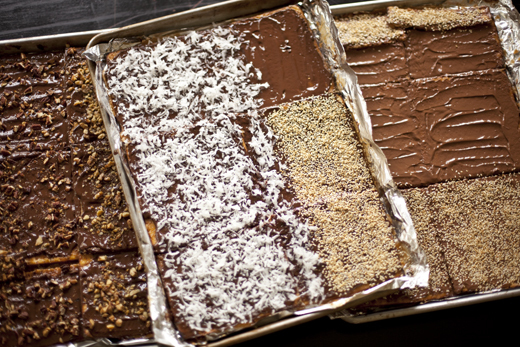 I’ve had chocolate-covered matzo but adding the caramel and then the coconut or sesame seeds is fantastic! Thanks for sharing a fabulous recipe! This dessert matzo sounds fantastic. Something this good could be dangerous. I have to pace myself with matzo. Too much does a number on my stomach – if you know what I mean. Great blog. I’ve never been here before but I will be back. Love this! We made this as kids with grandmother all the time. Instead of matzo we used saltine crackers. Looks really good, never made something like this! I was so excited to make this recipe yet the caramel part in mine turned out with pieces of sugar in it – as if i had just sprinkled the sugar on top of the matzos and not heated it with butter at all. Why might this be? Could it be that I didn’t use enough butter – I do confess, I did cut down on it a bit. I’m afraid the reduced butter is the culprit, it has to be just the right ratio or the sugar will just stay crystalized. Hi Zoe – I just had two pieces of this that my friend made. She used actual caramel (I couldn’t figure out your recipe that said caramel but there was no caramel in the ingredients!). I guess the butter and the sugar are the caramel! She sprinkled salt (I think Kosher salt or sea salt in the top. I am not Jewish – and this reminded me of a butter nut crunch bar that I used to eat when I was a kid. Yes, the combination of butter and sugar makes the caramel. So glad you enjoyed it! Hi Zoe, I made the chocolate caramel matzah according to the recipe that was published with the Ina Garten article. Not being an experienced baker, I had no idea how hard it would be to handle the caramel. The recipe said to pour it over the matzah and that is when the mess began. It went everywhere and was hard to control. I now see that your website said “spread it”, which makes more sense. Because of the splattering, it dripped onto the bottom of the oven and caused terrible smoking. But the results were still delicious and left me craving more! So yesterday I made a simplified version that was just as good. Our guests loved it. I spread a thick layer of butter on the matzahs, put a thick layer of brown sugar on top of that and baked it until bubbly. Then I added the chocolate and went from there. The results were still very yummy. Thank you so much for trying the recipe. I am glad it was tasty, albeit a challenge. The magazine had limited space for directions, so I am happy you found my website to see more details. Let me know if you have any questions! These are amazing- thank you! Quick question- 2 of my kids only like white chocolate. I couldn’t get it to melt or spread. I just stuck it back in the oven on warm, hopefully that will help. Did I do something wrong? The milk chocolate was perfect (too perfect! )…they might not make it to seder tonight. If it was white “coating” chocolate, it doesn’t have a very low melting point, which means it won’t melt just from the heat of the baked matzo. You may have to melt it over a double boiler, then spread it over the matzo. I burnt it in the oven :(. Thankfully I don’t need it until tomorrow night’s Seder. I realized after that I needed my chocolate machine. I should have known better. Thanks! Happy Passover! Hi Zoe – I’ve been making chocolate covered matzah for years, but this year I want to try making it with dairy-free butter, so it’s a parve dish. I saw that you listed Passover margarine on your ingredient list – have you ever made it with that, or do you always use butter? I get nervous using margarine for baking, since sometimes it doesn’t melt nicely! Thanks for your help! I always use butter when I can. I have used butter substitutes when baking for vegan friends and for passover, I’ve had good luck with earth balance and other butter substitutes. I think it will do just fine in this recipe. Maybe try a small batch to make sure you like the results. I’ve made this recipe for years and brought it to my sister-in-law’s seder.The rule is, I don’t get in the door without it. Can this be shipped? If so, do I have to use cold packs or will the chocolate stay solid during its travels? Thanks. OMG, I just made this and probably ate about 1 matzoh worth! It is sooo good. I made it for my hubby’s boss but I’m thinking I will have to make more tomorrow! Hi Zoe: Just moved to a ‘senior place’.and once a month I have to bring a treat-!! This would be great as I’m sure many of them never had Matzo-!! I know they will love it as I do-!!! I tried to make this with Mother’s unsalted parve kosher for Passover margarine and the margarine stayed in liquid form and wouldn’t mix or adhere to the brown sugar. I had to throw out the entire mess. An expensive lesson. What did I do wrong. I used a non stick pot. Did it come to a boil? If the sugar gets hot, it will melt slightly and be easier to whisk together. You can also throw it into a food processor to emulsify it. Unless it burns, there is almost always a fix. last year I stole your idea for matzoh crack s’mores with homemade marshmallows, torched, and it was one of the BEST things I’ve ever eaten. Question: How can I get the matzoh crack cut into neat squares? THANKS! I used a very sharp knife, but still had them break into strange shapes. One thing you can try doing is making the cuts right when the matzoh comes out of the oven, so it is still slightly soft. Once it sets up, it is hard and brittle, which makes it harder to cut. If they cool off before you get the chocolate on, just pop them back in the oven for a few minutes. Thanks for your reply. Yes the margarine and brown sugar came to a boil for over a minute and started to smoke so I removed it from the heat and then tried again over the heat. Do you mean that at this point when it cools down a bit I can put it in my Vitamix to emulsify and then place back on the heat for a few more minutes? You want to whisk or get it into the vitamix when it is still hot enough to be liquid. I would take it off the heat and whisk vigorously in the pan. It can take a minute or two of whisking to get them emulsified, but typically it will come together. If that doesn’t work, then the vitamix will do the trick. After I emulsify the mixture in the Vitamix, do I cook it again, or just spread it on the matzoh, and then place in the oven? Sorry, I don’t understand. Thanks. You can just spread it over the matzoh, it will cook more in the oven. You are only cooking it on the stove to make it spreadable. Last question, I promise. Can I just mix margarine and brown sugar in my Vitamix, spread this on matzoh, then bake in the oven, and not cooking mixture on the stovetop? And if I can do this, should I just mix it until it comes together, or should I let it heat up in the Vitamix the way I would when making soup? Thanks again. You read my mind, but I wanted to try it before making the suggestion to you. You can try creaming the butter and sugar together first and then cooking it. OR, and this is radical, you may even be able to spread it on the matzoh without cooking it first and just let the process happen in the oven. My only fear with that is it may separate in the oven. If you try it first, let me know how it goes. I am so thrilled you tried it. I can’t believe I haven’t been making my own forever.